1. Go to the APP store on your smart phone. 2. Search for the “GEOCACHING”APP. There are several APPs available. 3. Select the APP “GEOCACHING” with the Registered trademark next to it. 5. Press the “GET” button. 6. “GET” changes to “INSTALL”. 7. Press the “INSTALL” button. 8. A sign in page to the APP store opens. Enter the e-mail password you use for your APP Store. 10.The system will send you a verification code. Enter the code when asked to do so. 11. Go back to the APP Store. 12. A “BUY” button should be displayed. The APP is free. Push the “BUY” button. 13. The main page of GEOCACHING should be displayed. E-mail address – This will be your e-mail address used for geocaching. User Name: - This will become your on-line nickname and login name. Password – This will be the password you use for the Geocaching website. Scroll down the list and find the Geocaching APP symbol and click on it. You must set ALLOW LOCATION ACCESS to “While using the APP”. Geocaching will show you the nearby caches wherever your phone is when you log into Geocaching. For a printable version of how to install the free APP on your smartphone, click here. To begin your Prince Gallitzin State Park Crooked Run Campground Geocache Adventure click here. 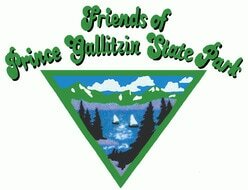 To begin your Prince Gallitzin State Park Geocache Adventure click here.